Mike Philippov: Hi, this is Mike Philippov from PracticeGuitarNow.com and I'm bringing you today another exclusive interview about the best ways to practice guitar. I'm on the phone today with Joe Stump who is one of the most respected and renowned neoclassical guitar masters of today. 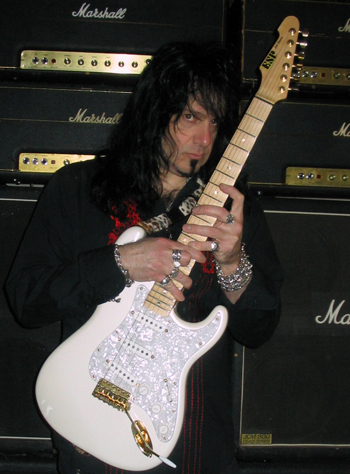 Joe has been ranked among the top 10 fastest guitar players of all time by Guitar One Magazine and he has also been a guitar instructor at the Berklee College of Music in addition to his touring and recording career. So for sure Joe has a lot of experience to pass on about how to practice guitar in the best way possible. Welcome Joe, it's great to have you here on this interview and I look forward to hearing your answers to my questions. Joe Stump: Cool, it’s nice to be here. MP: My first question is: Do you believe in the phenomenon of natural talent? If yes, how much do you think that talent contributed to you becoming the great guitar player that you are today? If not, what do you think is the single most important attribute that one needs to have to become a great guitarist like yourself? JS: Many different guitar players have different levels of natural talent. It all comes down to the guitarists’ upbringing and who they are as a person. It all factors in to a certain extent. For myself, I wasn’t blessed with a huge amount of natural talent, I got to where I am through the old school way of hard work. So, it (natural talent) is true to a certain extent, but it’s not like without it you can’t develop into a good guitar player. The technical skills that make someone a great musician, such as having a great sense of time (rhythm) or a good musical ear can of course be developed through practice, but certainly some guitar players have more of it (natural talent) than others. MP: How have your approaches to practicing guitar evolved over the years? When you started out playing guitar, what did you focus on then and how has your focus changed between then and now? JS: When I was first starting to play guitar, it was a completely different time. Back then, there weren’t people to help you if you wanted to play rock or hard rock and there weren’t instructional DVDs or guitar players who were high level guitar teachers playing in that style and you had to do everything on your own. I basically learned in the old school way when I was younger - by learning solos of my favorite guitar players and lifting solos off of records and then also when I studied at Berklee - learning classical pieces, such as music by Bach or Paganini or C.P.E. Bach etc… So it was a completely different time. Now with all the information available, guitar players can streamline their guitar practice sessions so that it is almost like a workout routine. Depending on how long your guitar practice routine is, you can work on your picking hand, legato, improvising skills, playing arpeggios and all of those different things. As far as me personally, my guitar practice routine is usually centered around what I have going on. If I'm working on a new record, then that becomes the music I'm working on while practicing guitar. If I'm gearing up for a clinic tour, then I practice the material I will be performing at those events or at live concerts. Now I'm sort of in the practicing “no man’s land” to a certain extent, because I just finished all guitar solos for my new record, so when I go out to support it next year, this is something I’ll be working on. That means I will practice to play those guitar solos live, whether to perform them during a concert show or as part of a clinic tour. But a lot of times I go between the disciplined school of practicing guitar and the school of guitar players who pick up the guitar and start going for it. I kind of walk in between the two, where I have certain things that I need to work on, but I don’t constantly sit there and drill the same thing over and over. I’ll keep coming back to whatever I'm practicing for memory’s sake and other reasons, but it’s not like I sit there for half an hour and play the same arpeggio section nonstop. I’ll usually end up practicing things thoroughly over a long period of time but in the course of a single practice session I usually focus only a little time on each individual item. MP: How do you decide what things to practice on guitar on a daily basis? How has that changed for you since you first started playing guitar compared to today? JS: Years ago when I was first developing, I would work on all types of things. Sometimes I would work on a solo by one of my favorite guitar players for awhile, then I would work on a Bach invention and then I would drill different scale patterns and arpeggio patterns to a click (metronome). Then I would be jamming over a track to practice my improvising. But it wasn’t nearly as organized and streamlined as it became later when I developed further and got more organized as far as the things I was practicing on guitar such as different picking techniques, arpeggios and improvising skills. I would work on different ideas from the guitar players I liked. Sometimes I may work on my vocabulary inside a certain scale and other times might be more about controlling bending and vibrato in certain registers of the instrument. MP: Again going back to your younger years of learning to play, when you were first starting out playing guitar, did you ever have periods of time when your guitar playing progress was slow (or maybe your guitar playing stopped improving completely)? If so, what were those experiences and what did you do to get past such plateaus in your guitar playing? JS: In this day and age, younger guitarists develop much faster (than what was common before) and then become frustrated, because after seeing themselves develop quickly, they all of a sudden hit a plateau and start to wonder why they aren’t breaking through it as fast as they would like. When I was younger, I just played guitar and I didn’t think. I always had the attitude of: “keep practicing, keep playing, keep getting better, I love guitar, guitar is fun”. So I was kind of ignorant and I wasn’t constantly analyzing my guitar playing. Now in this day and age, younger guitar players are much more mature, which is cool from a technical standpoint, but sometimes they are so focused, that they are missing some of the rock vibe and the kind of attitude that you want to bring to the guitar as well. MP: What things did you do to keep your guitar practicing fun without becoming distracted from the specific guitar playing skills you were trying to improve? In other words, how did you manage to have fun while learning to play guitar and still make progress? JS: I did this by mixing up and working on different guitar playing skills. When it comes to solidifying something in your guitar vocabulary, there is no substitute for working on it on a consistent basis for an extended period of time. It’s great to check on it (an exercise) daily and to be consistent, but if you get too hung up on playing one thing on guitar, you will make it stale and not much fun. A lot of technically minded guitar players have a tendency to practice things with a metronome all the time and put too much focus on isolated “exercises” as opposed to learning to play guitar in musical contexts. MP: Can you give an example of a specific guitar playing problem that you had a hard time improving and what was the process that you used to get better at that issue? JS: I think one thing that is very frustrating and is something that all guitar players are looking for at all levels is “consistency”. Command and technique are all about control, and consistency means executing things at various tempos, being able to fall out bed and play guitar, as well as controlling the tones all over the instrument, such as bending, vibrato and intonation. This area of guitar playing keeps improving for myself as well. Even though I’ve been playing guitar for a very long time and I play at a fairly high level, I haven’t stopped being conscious of this skill and working on it. So that is something that I think not only I struggled with but everybody struggles with. The longer you play guitar and the higher level you play at, your consistency of execution becomes very important. Whether it is a technical display or a finesse thing where you control certain tones at certain registers, those are the things that, as you play guitar at a higher level and you play for longer and longer you will continue to get better and better at. MP: What were some guitar practicing mistakes that you remember making during your earlier years that slowed down your musical progress? If you had to go back to start learning to play guitar all over again, what would be the things that you would do differently in order to become the guitar player that you are today faster? JS: That’s a very good question! When I was a student at Berklee when I was younger, I was playing in hard rock bands, playing hard rock of the day, bands such as Deep Purple, Led Zeppelin, Jimi Hendrix, UFO and all the great guitar players of the 70s. When I got to Berklee, back then it was a strict jazz only guitar program. I was only a young kid back then and I wanted to do well, so I practiced and played jazz. Although it wasn’t bad, as I was playing jazz and fusion towards the end of my Berklee stay, I realized that I wanted to go back to only playing hard rock and metal. It wasn’t so much a “guitar practicing mistake” as it was more about “direction”, but that was one of the smartest decisions I ever made. I think that if I had stuck, direction wise, to what I loved and what I really wanted to do, I might have gotten to where I was going faster. I am not saying that everyone should play in only one style, but it’s nice to have direction at a very young age, because you are constantly feeding it. If you are a blues guitar player, you will then listen to the king (BB King) and Lonnie Mack and other blues musicians, or if you want to be a great metal guitar player or a classical guitar player, it takes a certain amount of devotion regardless. MP: What were the biggest sources of your guitar/musical education when you were developing your guitar playing skills? You already mentioned going to Berklee and I'm sure that was very valuable for you, but did you also have private guitar teachers or what were some of your other sources of guitar/musical education? JS: To tell you the truth, I did it all primarily on my own through the music that I love, drawing from my influences of guitarists such as Ritchie Blackmore, Yngwie Malmsteen, Al Di Meola, Gary Moore, Michael Schenker, Uli Jon Roth, Jimi Hendrix or composers such as Bach, Paganini or Vivaldi. So a lot of my guitar vocabulary and my playing has developed the old school way of trying to learn the music that I loved and doing my own thing with it. I loved Blackmore and Schenker and Uli (Jon Roth) and I would learn their guitar solos and their arpeggio bits. Then Yngwie came along, and I thought: “Hey, he likes all the same music that I like, so I bet that I'm going to like this guy with the hard to pronounce name” and he had even cooler, more intense arpeggio sections and things of that nature. I was already familiar with a lot of his picking vocabulary, from studying Di Meola’s music as well as Uli and Bach, so it evolved from there. Also I remember having Michael Angelo (Batio) first Star Licks video, so some of his material also helped me. However, as far as any guitar instructors - it was just me by myself and I had no help. MP: What were some of the most important things that you got out of going to Berklee? How did that experience help you to develop your guitar playing more? JS: Aside from the information or any of that, I studied with this one guy there who was a heavy duty jazz guitar player. He was really nasty to the students, and many of his guitar students would walk out of his lessons crying. I wasn’t one of them because I was one of his better students at the time, but he was so intense about playing guitar, and every time he picked up the guitar he meant business. That was one of the things I took away and remembered, even though I am the opposite and I am quite nice to all my guitar students - too nice actually. However, having that intensity every time you pick up the guitar was one thing I took away. In addition, the fact that you are living and eating and breathing and sleeping guitar and music continuously. I’ve always been one of those guys who loves guitar. Today is my day off and I’ll probably play guitar for at least 4 hours, so I'm always at it. MP: What do you think are the top most critical things that one needs to do or have to get the most results possible when practicing guitar? JS: Walking the line between a “rock” approach of enjoying the guitar and rocking out like everybody likes to, but trying to mix that with some disciplined guitar practice. Too many guitar players just play, and although it’s cool to play, there is a difference just playing and “practicing guitar”, so a mixture of both is very healthy. In addition, it is important to try to keep your attention span focused and together when you play guitar, because everybody’s mind can start to drift a little bit after practicing guitar for hours. Another thing is to make sure that you are playing things properly. Don’t practice something for a period of time only to listen back to it and realize that something that you thought was sounding good in reality doesn't sound all that good. Recording yourself is great for all guitar players, because you can always step away from what you played, hear it and say: “Oh, that’s not happening at all”. So being self critical is helpful, but not to the point where it is detracting from practicing guitar. I’ve heard all kinds of questions from guys who are obsessed with everything, such as: “how much of the guitar pick is exposed between my fingers and the string” or “how tightly do I grip the guitar pick”. So some guys are really obsessed with that, but the fact is that if they simply played guitar more they would find the answers to such things on their own. Because you can have one guy who is completely obsessed, who is looking at himself in the mirror and constantly critiquing himself, and another guy who is locked away with the metronome and is not wondering if he is holding the guitar pick correctly - he is simply going for it. So obviously, somewhere in between is cool. MP: How do you approach "practicing" the elements of musical creativity in your guitar playing? What are some of the things that you consciously do to become more creative on guitar? JS: I listen to different things to get inspiration, such as classical records or any of my guitar heroes. I also sometimes listen to various metal bands, because I play in a power metal band HolyHell, so I write for that in addition to making my own records. But a lot of times, I go into my work room when I have a day off and I start playing guitar and things start to flow. So I'm very lucky in that I don’t practice “being creative”. If I’m inspired and I just start playing something and something comes to me, then I have to stop what I'm doing practice wise and I have to devote some amount of time to that new idea and document it. And next thing you know it ends up being something on a record. Sometimes it’s a melody, or a riff, or sometimes I can put an entire tune together. A lot of times I’ll be practicing a neoclassical section of something and I have no idea of where it’s going to go, and next thing I know it becomes an arpeggio section in the middle of a track on a record, or a solo piece. MP: Okay, that about wraps up all my questions for you today Joe. Thanks for doing this interview. You shared a lot of great insights about practicing guitar and I'm sure that everybody who hears this interview is going to have a lot of great points to take home and apply to their guitar practicing to become better guitar players. So thanks again and all the best to you in your future music career projects. Learn how to practice guitar like the best guitar players do.